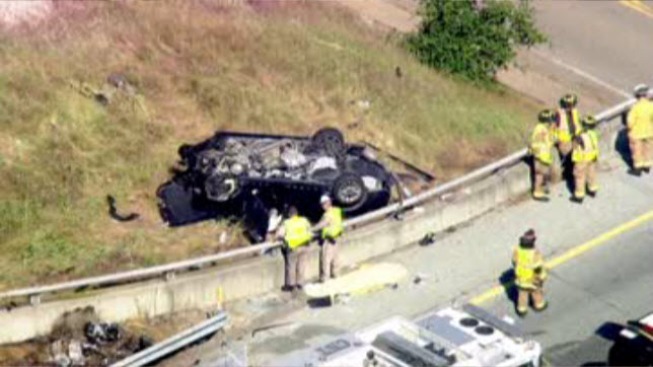 A 47-year-old Los Gatos woman died Monday after her car crashed into a cement wall on northbound Interstate Highway 280 near Palo Alto, overturned and landed on its roof. A witness told officers it seemed as though the driver was using the shoulder of the road to pass at 90 mph, according to the CHP. Around 9:05 a.m., California Highway Patrol officers responded to a report of an overturned vehicle that crashed into the center divider on northbound Highway 280 just south of Page Mill Road, according to the CHP. A black Hyundai Sonata crashed head-on into a cement center divider. The car then overturned and went over the divider, CHP Officer Art Montiel said. The car landed on its roof in between the highway's northbound and southbound lanes before catching fire, according to Montiel. Other motorists stopped and were able to pull the woman out of the vehicle, but she was pronounced dead at the scene, Montiel said. Her name has not yet been released. There were no other passengers inside the car and no other vehicles were involved in the crash, according to Montiel.